Greetings from RTU. I visited Germany and Switzerland for two weeks at the beginning of August to meet friends and supporters. I met Dr Helmet Weyer from Action Group 365, Mr Andreas Marquart and the team from Mission in der Einen Welt eV, Mr Hans-Jurgen Zweigner from Stiftung Lichtblicke in der Welt and Mrs Helen and Andrew from Nandri and presented the activities of RTU. I also met the parishioners of St Johannes, Eisenbach, whom I have known for the past 21 years. Everywhere I received a very warm welcome. They expressed their condolences on the death of James Kimpton, wished the good works he started be continued and assured their continued support to RTU. You will have heard that Kerala, our neighbouring State, has been ravaged by torrential rains which have triggered landslides and floods with lives lost, many made homeless and severe disruption to air, rail and road traffic. On the other side of the Western Ghat Mountains in Tamil Nadu where RTU is based we have not had enough rains during this monsoon. Last month saw 30% less rain and there is insufficient water for drinking and cultivation. Our area, especially Miriam Children’s Village, is still facing severe drought. As there is no water in the bore well, we are buying water from the water tanker suppliers for our children’s daily use. Buying water from outside is becoming expensive for us. To help reduce the costs and to solve the water problem in Miriam Children’s Village, we are hoping to buy a new water tanker with a tractor so that we can take water from another of our bore wells. 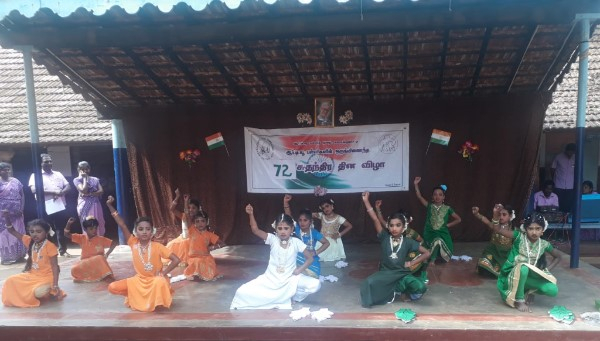 Pushparani Girls’ Hostel and Miriam Children’s Village celebrated their 11th and 20th Anniversary Days on 18th and 15th August respectively with special dances, speeches and dishes. It was very amazing to see the variety of cultural programmes performed by our children with great zeal and good spirit. 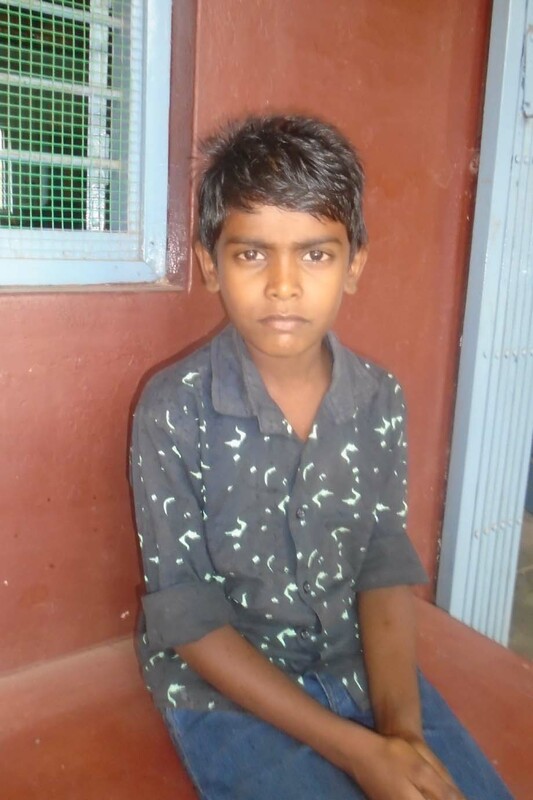 Manikandaprabu, aged 9, has recently come from the remote village of Kunnuvarayankottai in Dindigul District. He lost his mother three years ago due to health problems and his father is HIV+ and suffers a lot with a weakened immune system. Due to this chronic HIV stage, he cannot go for any work and lies in bed. Because of this, Manikandaprabu has been raised by his grandmother. While her health was good this worked well but now she finds it difficult to care for him due to her old age. During this time, the father came to know about RTU through his friend and brought him here as he is in a dying condition. He wants to make sure that his son is safe and secure in a good place. Seeing the poor condition of this boy, we have accepted him in our Miriam Children’s Village. Now Manikandaprabu is studying 5th standard at our Arul Malar School in Genguvarpatti. This year, India celebrated its 72nd Independence Day with a national holiday on 15th August. All our students celebrated it with zeal and spirit in our St Peter’s School campus. Fr Maria Antony, Education Manager of RTU’s schools, hoisted the flag and then our school music band took over the stage and played the national anthem. The children performed their scintillating march-past, cultural dances and speeches with enthusiasm. All the teachers thanked the students for making the event a grand success. 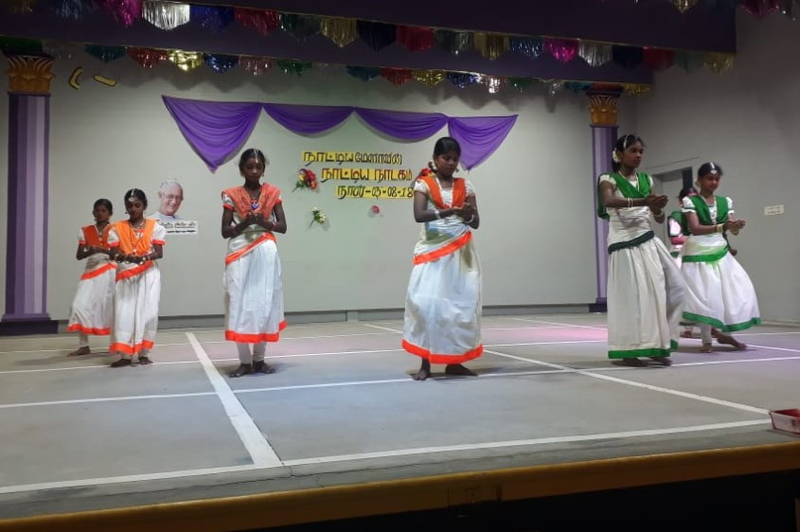 On 3rd August, St. Peter’s Higher Secondary School conducted Nattiyamela (a dance festival). Our students were given the opportunity to play an active role in these activities and helped them learn how to work in a team and develop creativity, critical judgment and aesthetic appreciation. UK volunteers participated in this programme and admired the children’s performance. It was a good occasion for them to exchange cultural values. St Peter’s Higher Secondary School football teams (juniors and seniors) participated in the district level sports competition held at Periakulam and won 1st and 2nd places. Our kho-kho and throwball teams also participated in this district level competition and won 1st and 2nd places. 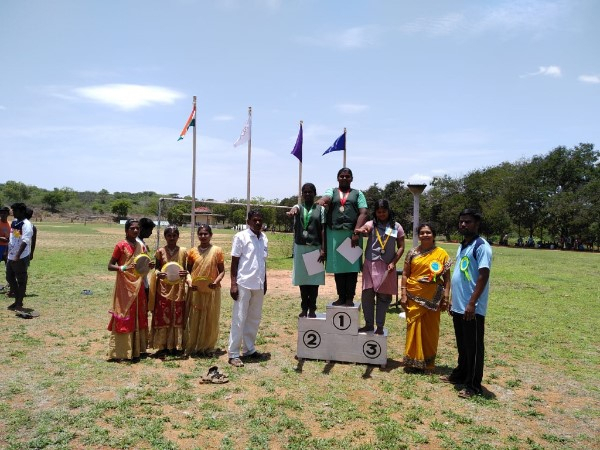 The district level throwball competition was organized in Theni for our junior and super senior girls’ teams. Our students won 1st and 2nd places. We appreciate all our team members who worked hard to bring laurels to our school. Now our super senior team is eligible to enter the state level competition. We wish them good luck. On 30th August 4th standard children from St Peter’s Primary School went to Manjalar Dam on a field trip. They gained knowledge about the importance of water storage and how the dam supplies water to the agricultural land in Periakulam Taluk. Children walked on the boundary walls of the dam and enjoyed seeing this massive dam that was surrounded by mountains. This field trip offered them experiential learning opportunities on the importance of growing nutritious food, and orchard and flower garden cultivation. On 31st August, a language and literary function in Tamil and English was conducted in St Peter’s and Arul Malar Primary Schools. Our children showcased their talents in oratory, essay writing, quizzes and fancy dress. The students participated in these competitions enthusiastically and the winners were awarded prizes. There is a good improvement in the children’s language. Fr Maria Antony attended this celebration and appreciated the children’s talents. All our day care centre and balwadi (pre-school) children received deworming tablets administered by our local Primary Health Centre. Mrs Gandhimalar, Health Supervisor, and her team member, Mrs Palanithai, organized the day. The Pushparani Clinic medical team completed their physical check-ups for all our balwadi children in our main campus. It was found out that some of the children suffer from viruses and sickness and received the necessary treatment immediately. Grama Shaba meetings were conducted in the villages of Viralipatti, Endapuli and A Vadipatti on Independence Day. 186 Self-Help Group members participated in this meeting and expressed their concern over the development of their villages. In the presence of Mrs Vijaya Chandra, Block Development Officer, Batlagundu, a social audit was organized on their local Panchayath budget. Our women’s group members raised the issue of constructing individual household latrines and street lights in their villages. 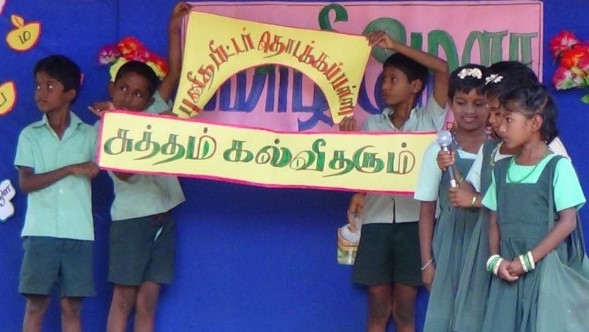 On 24th August, a rally was organized against child abuse and prevention by Tamil Manila Pengal Iyakkam. 15 representatives from our Self-Help Groups participated in this rally from Bangalamedu to the Collector’s office in Theni and presented a petition to the Theni Collector to prevent and stop child abuse by taking immediate action and to amend the rules in the Tamil Nadu legislative assembly. 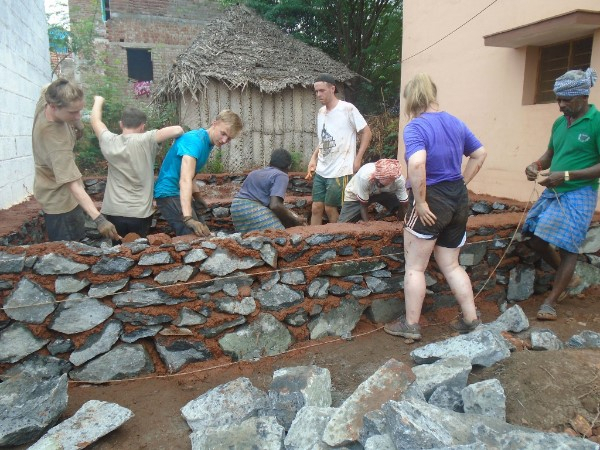 We were fortunate to have had ten volunteers from Lasallian Developing World Projects in the UK who stayed with us for a month and built 3 houses in Genguvarpatti and 5 houses in G Kallupatti villages. 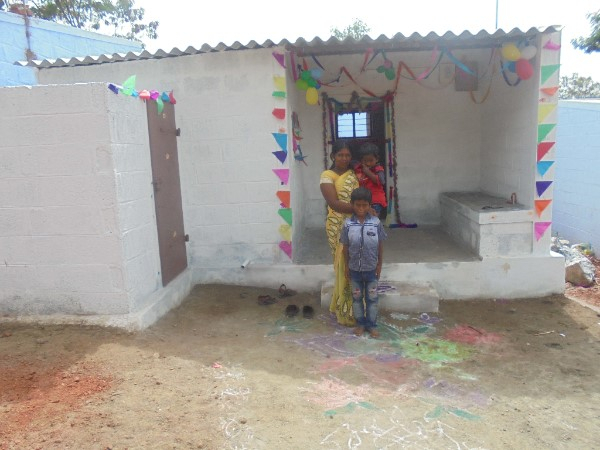 The families were very happy to have a new house and welcomed volunteers with great joy for the house-warming ceremony. They shared their joy and love with one another and expressed their sincere thanks to each one. We sincerely appreciate and thank all the volunteers for their generous support. I am Priyanka, 23 years old and I live at Genguvarpatti village in Theni District with my two sons. My husband died of a heart attack last year. After that, I had to start going to work on construction sites as a daily labourer in different places and managed to earn a small wage to feed my children. We lived in a small hut without any basic facilities. My hut is located at the end of the village which is exposed to poisonous reptiles. I struggled to bring up my children in that dangerous environment. My hut was not strong enough to face the heavy wind and it started to fall down slowly. Even during the last rainy season our house was marooned. I stayed in my friend’s house with my children for a few days. During this difficult time, I made a request to RTU to build a house for us. Noticing our sufferings, RTU generously built this house for us. With my meagre earnings, I would never have been able to build this type of safe house. Now my children are very happy to live in this house with all the facilities. I feel safe to live in this house. I consider this as a great gift to my family and this will enable me to give education to my children without any fear. Now I live with my children with peace. Friends, it’s going to be almost a year, since James Kimpton died. We want to mark this occasion by recalling our long-lasting memories of his life. 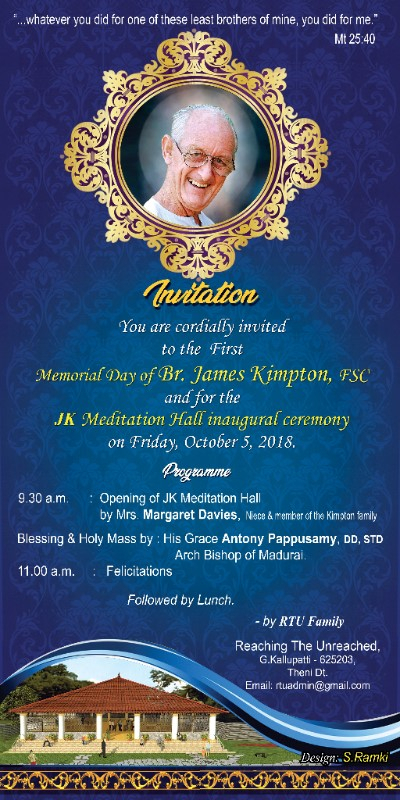 To celebrate this, we have built the JK Meditation Hall. The inaugural ceremony will take place on Friday 5th October. A hearty welcome to you all!! We thank you all for your incredible support fo all our undertakings. We know that it is the tireless work and dedication of well wishers that makes all the difference for our organization. You have been very generous to join hands to fulfil the needs of our children and show them a bright future and you have been extremely instrumental in their success. Without your help it is not possible for us to deliver such dedicated work. Our whole team would like to thank you for being such wonderful and generous donors. Thank you for your contribution. Fr J Antony Paulsamy, OFM Cap.